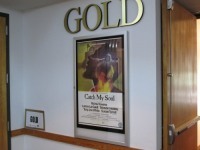 Readers will no doubt recall the recent amazing news that Patrick McGoohan's only directorial movie, "Catch My Soul" AKA "Santa Fe Satan", for many years thought lost, had been researched by Tom Mayer and a subsequent print of the film found in a dusty vault. Thanks to this print, the movie, as advertised on TUW (see below), was screened at the recent Riverrun Film Festival in North Carolina. Tom Mayer of course attended the screening, as did several other TUW readers, and as such TUW is delighted to announce that Tom has kindly reviewed the event/screening, and also thanks to some updated restoration news, added a third part to his wonderful series of articles, "Total Immersion". Click HERE to read part 1 of the trilogy, HERE for part 2, or HERE to go straight to part 3 and Tom's review of the screening. Tom's work also gets mentioned at a comic blog HERE, on Facebook HERE, and again on Twitter HERE. With thanks to Tom Mayer for this news item. Images (c) Tom Mayer.